Although some reportedly had a sneak peek at Samsung’s latest handset at an event in Germany at the tail end of last week, it wasn’t until Monday that the Korean company decided to announce it officially. Aimed at what Samsung is calling “the social user,” the Galaxy Ace Style is a mid-range, entry-level smartphone with basic features, though interestingly it’ll be one of the first phones in this sector of the market to run the latest version of the Android OS – KitKat 4.4 – out of the box. Samsung’s TouchWiz UI is also part of the package. At just 4 inches, the WVGA (800×480) display might feel rather on the small side for many consumers more used to larger devices, though its compact size may of course be seen as an advantage by others. Under the hood you’ll find a 1.2GHz dual-core processor, 4GB of storage (expandable via its microSD slot), 512MB of RAM, and a 1500mAh battery. The Seoul-based tech giant has plunked a modest 5-megapixel shooter on the rear (with flash), while the front facer is fitted with a 0.3-megapixel sensor. 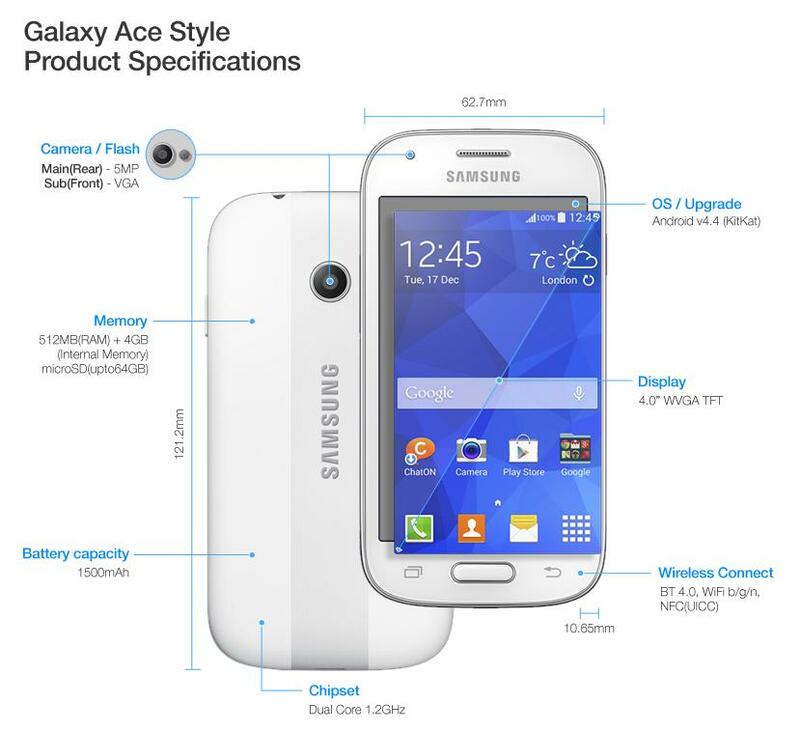 Geared toward “young, social consumers,” the Galaxy Ace Style will be available “beginning in April,” which we guess means now. At the moment, we only have a price for it in euros, with reports suggesting it’ll go for between €200 ($275) and €300 ($412). Although Samsung says it’s launching the device globally, its reasonable price and straightforward specifications suggest it may push the handset in emerging markets such as India and China, countries where it faces increasing competition from local manufacturers.